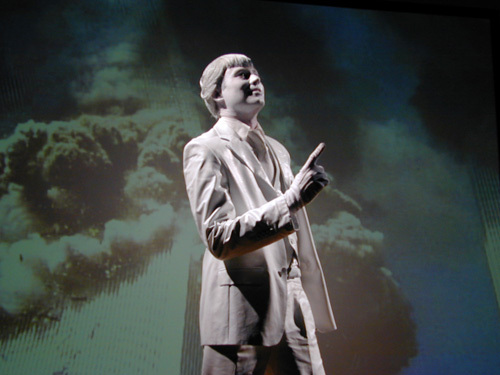 In 2003 I co-conceived and created (with director Robert Allen) the hour-long mixed-reality performance work The Roman Forum Project as an examination of the American scene since the postelection crisis of 2000. My roles on this project included lead writer, environment and projection designer, online director, and supervisor of all technology. Comprising a thematically linked group of sketches, it premiered at the Beall Center for Art and Technology at UC Irvine in March 2003. Opening just a few days before the war with Iraq began, it offered a critique of the prolonged crisis in American politics and the nation's vision of itself and its role on the world stage. As a sequel to The Roman Forum 2000, the project centered on five Roman characters from around the 1st century C.E., a time when Rome's republican government was under great strain from the stresses of building and maintaining a large empire. Ranging from a Roman empress to a captured slave, these voices from an empire that Americans have tended to admire spoke directly to America's double role as democracy and international superpower. The Roman Forum Project was included in theater critic Ravi Narasimhan's list of the 10 best Los Angeles–area shows of the previous three years, as published in the Los Angeles Times on January 11, 2004. Quote: "The multimedia production was a scathing indictment of the 2000 elections, staged in the heart of Orange County." As an ensemble work designed for non-traditional spaces, The Roman Forum Project was a kind of "media commedia" melding Internet technologies, video projections, and classical Greek and Roman theatrical traditions. Scenes included monologues and multi-player situations ranging from purely actor-based performances to technologically mediated spectacle. Every performance was streamed live to the web, and a cast of online performers took part in the piece via the Internet. 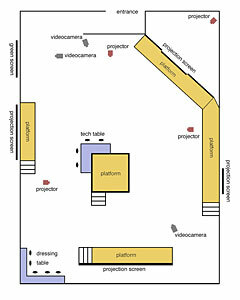 The piece was designed to be performed in the round, with several widely spaced, raised platforms for the performers (yellow areas), 1 rear-projection screen, and 3 front-projection screens of various sizes. The violet areas indicate 'backstage tech' of the kind that is normally hidden from the audience. The main tech controls (audio, video, internet) were placed dead center in the space, while the dreassing room was in a corner. 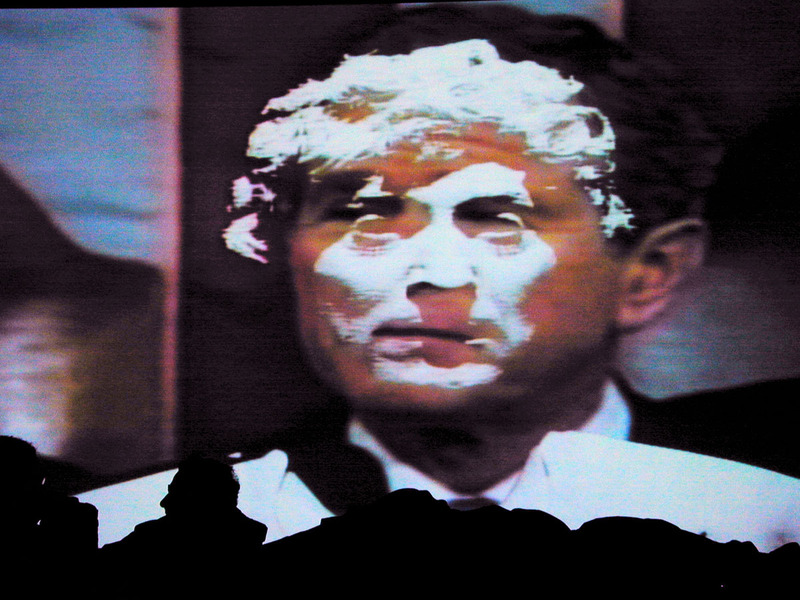 A live-video green-screen area was also visible to the audience, which circulated throughout the space as the piece progressed.